Spring makes me want to shop. There are only but so many sweaters I need and when it's cold I basically just live under my patagonia jackets. But Spring. Oh, sweet Spring. You make me want to S-H-O-P. 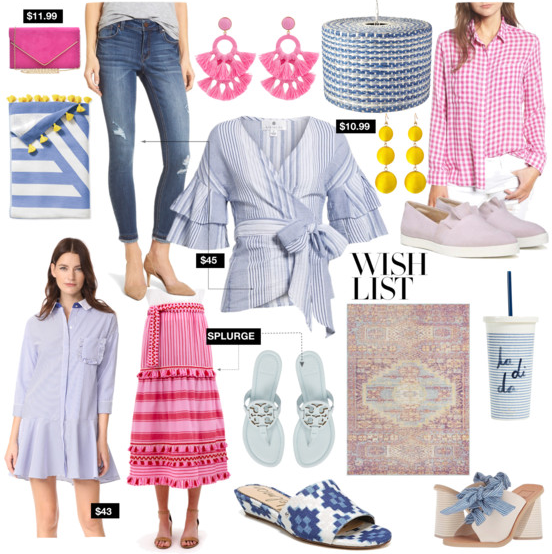 In case you need to chase the winter blues away with some pretty sandals and pastel dresses along with me, I've rounded up some of my favorite pretties of the week. Give me all the pretty tops. As much as y'all know I love a pretty dress, I usually end up spending most of my time in tops and jeans. Probably because then I don't have to shave my legs or worry about ashy knees. ha! You should always own a great fitting pair of blue jeans, white jeans, and cut-off jean shorts.